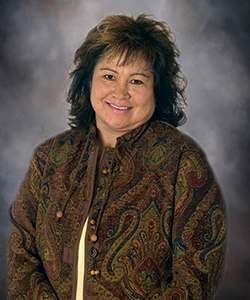 In December 2017, Carole Depoe Lankford (Kootenai and Salish) was re-elected to her seventh Tribal Council term for the Ronan District of the Flathead Indian Reservation. She is a lifelong resident of the Reservation, graduating from Hot Springs High School in 1977. Before being elected to the Tribal Council in 1993, her Tribal career included work in Tribal Forestry, Fish and Game Conservation, and Tribal Administration. Her Tribal Council service has run concurrent to the CSKT’s self-governance efforts that begin in 1992 and she remains committed to furthering CSKT’s successes. Carole and her husband Tom Lankford (Gros Ventre) are the collective parents of four sons and three daughters who have blessed them with 14 grandchildren.